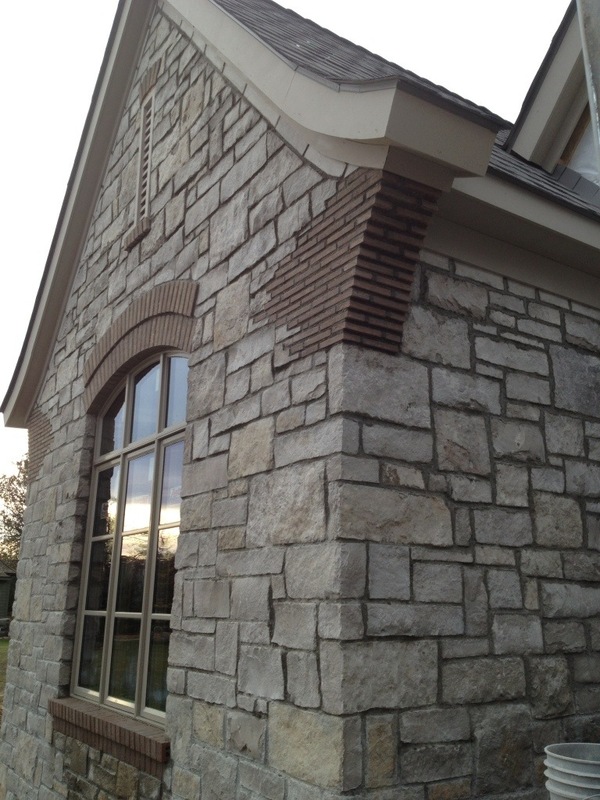 Our masons saved the best for last and have completed the library gable with its brick arch and corbels. Here is the fireplace nearly complete inside the lanai. The two pieces of wood sticking out are called corbels too. These corbels are made from reclaimed barn timbers and we have a hefty barn timber mantel that will be installed on top of them. 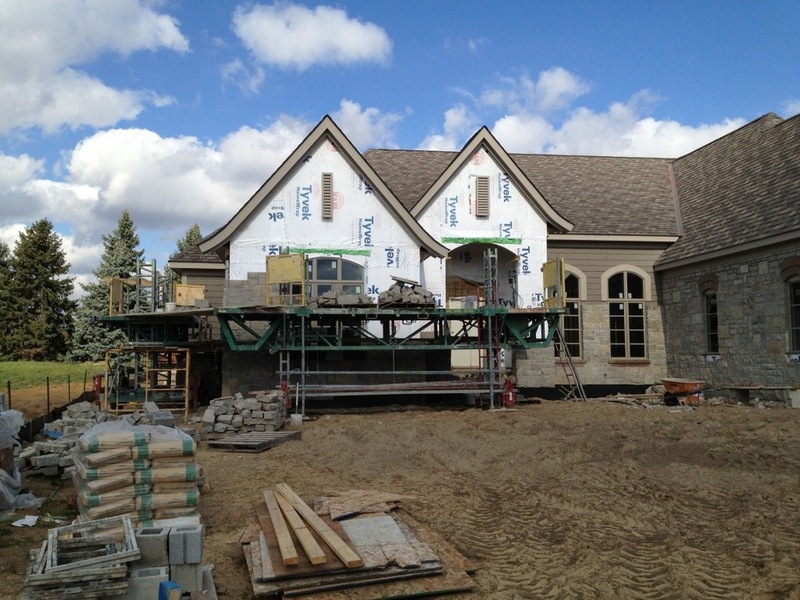 The masons will be moving on to the front entry and then topping off the chimney next week. And we will be right behind them with grading, irrigation, landscape and sod. Ahhh! Feels good to be on the old critical path. Our masons have been reaching new heights both literally and figuratively as the beautiful brick arches have been built in several places. Here’s a little closer look at these well executed details. So what do you think, really? Our stone masons, led by Doug, started work this week. They really are Rock Stars in a manner of speaking. Remember this sample panel? It is now the standard that Doug and his crew will use as a reference as they start to veneer the walls of our home. They have started by preparing the foundation for the final grades we need to accomplish – sort of like fine tuning the work our basement wall crew did a few months ago. You can see here in the lanai area how it is now set up for the slab to be poured. It is actually up above the basement wall against the wood framing but our masons have FLASHED the area with a heavy rubber membrane that will protect the wood framing from moisture. Inexpensive block and cull bricks are used in areas that will be concealed when the slab is poured – no sense wasting our expensive stone work! Before they can really rock out there is a lot of prep work to do and inspections to pass. 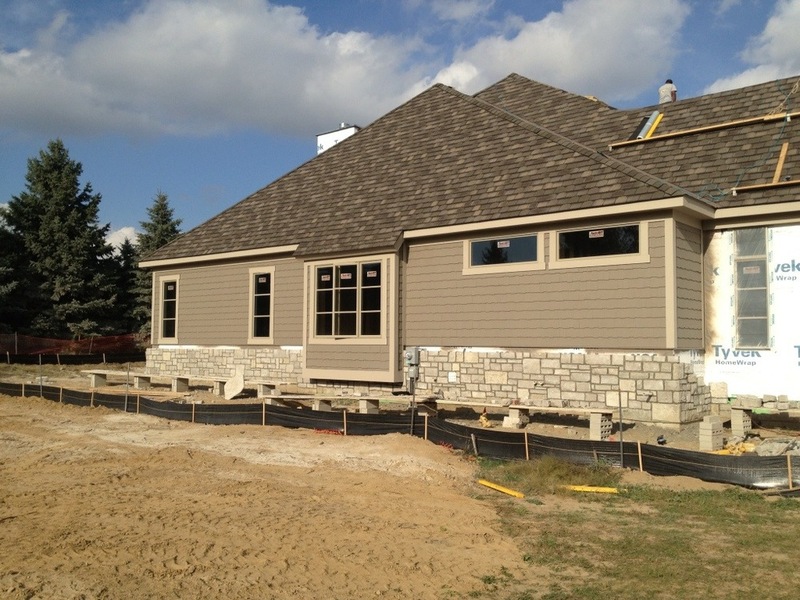 Stone (and brick too) are held together with mortar and abut windows doors and siding. These joints can leak and we can also get condensation in the gap between our Tyvek covered frame wall and the stone veneer. Since it is impossible to keep the moisture out we do the next best thing – we provide a path for it to escape to the outside by creating drain holes called “weeps” around the base of the stone just above the finish grade where our sod or beds will be. To make sure any water that reaches the bottom of the wall does not enter the house, our masons place a heavy rubberized membrane along the entire brick ledge and tuck it under the Tyvek. Then they lay the first course of stone with plenty of weep holes filled with a fibrous material (so the path for water stays open but bugs don’t crawl in). 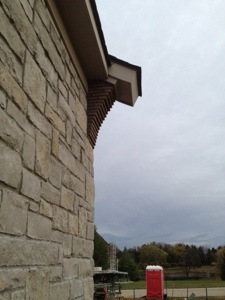 In Bloomfield Township the inspector wants to see the area between the stone and flashing with gravel to help channel water to the weeps and keep them from filling with dirt, debris or mortar falling from above. Take a look at these pictures showing how this was done. Oh, by the way, it really looks like a house now, doesn’t it?